A word about the author: Charles Andrew Coates (1862 -1945) was born in Bradford, England and died in Teignmouth, Devon. Saved when a young man, he never enjoyed robust health and the many occasions when he was laid aside through illness were put to good use in prayerful meditation and the study of Holy Scripture. 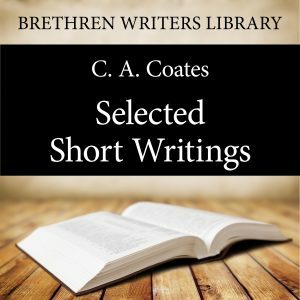 Because of his ill health Coates could not go about teaching and preaching, but he could not be idle for his Lord, so instead he produced many tracts and books, and he also used his poetical ability to compose a number of poems and hymns.